Comfort food has a special place in our hearts. It brings the family together around the dinner table where everyone can share their thanks and stories of the day. It’s the time to sit back, relax, and enjoy some good cooking. And it wouldn’t be a family dinner without some delicious homemade biscuit recipes. Biscuits go great with about every dish you can imagine. From soups and stews to casseroles and slow cooker meals, biscuits literally are the bread and the butter of the dinner table. We’ve collected some of our favorite homemade biscuit recipes for you that the family will love. So, take out the butter and prepare yourself for our collection of Comfort Food: 15 Homemade Biscuit Recipes. Don’t get us wrong, we love the ease of store bought biscuits, but there is something more rewarding when you take your first bite out of a homemade biscuit. The biscuits flaky, buttery goodness melts in your mouth bite after bite and has you reaching for seconds. Plus when you have the time to make a homemade biscuits recipe, you can make them the way you really like them. Some people prefer biscuit recipes that produce a heavier hearty biscuit; while others prefer their biscuit recipes to yield light and fluffy biscuits. No matter how you prefer your biscuits there is one thing everyone can agree on. And that is that it just isn’t a full dinner without some homemade biscuits. 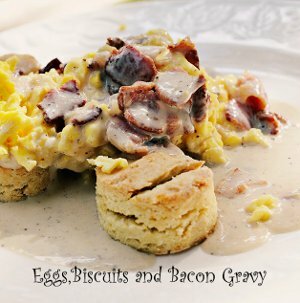 Bacon Gravy, Biscuits and Eggs - Nothing says comfort food like some good old fashioned biscuits and gravy. Made with thick bacon and homemade biscuits, breakfast is going to become your new favorite meal of the day. Angel Biscuits No Rising Necessary - For light, fluffy and delicious biscuits, these angel biscuits can't be beat. The dough is easy to make and even keeps well refrigerated for about a week, so you can prepare one day and bake on another. 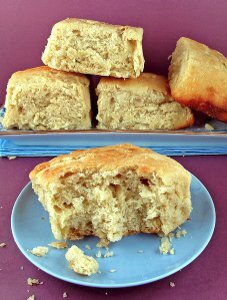 Awesome Amish Biscuits - Easy, down to the basics, these Amish Biscuits are great to add to your authentic Amish recipes collection. 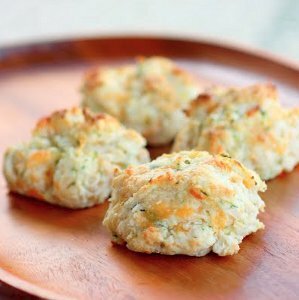 Cheddar Bay Biscuits - Tasting just like Red Lobster's Cheddar Bay Biscuits, this buttery biscuit recipe is a keeper. Made with Bisquick, Cheddar Bay Biscuits are easy to make and even easier to enjoy. Country Biscuits & Sausage Gravy - There's something comforting about old fashioned country biscuits and gravy. It may be the simplicity of the dish, or the childhood memories of the family sitting around the breakfast table. This homemade breakfast recipe will remind you why it is a classic. Potato Buttermilk Biscuits - Served warm from the oven, these delicious biscuits are moist and flaky. Spread on some butter and enjoy for breakfast, lunch or dinner. Overnight Angel Biscuits - One of the butteriest, flakiest biscuit recipes you'll ever set your eyes on, Overnight Angel Biscuits are a must. Made with yeast and baking powder, the biscuits rise overnight as you let them sit in the refrigerator. Southwestern Biscuits - These are not your mama's biscuits. This tasty homemade biscuit recipe adds a little bit of a kick to the ingredients. Flaky and delicious, enjoy with a slice of butter. Cracker Barrel Old Country Store Copycat Biscuits - These light buttermilk biscuits are the perfect start to any meal. Serve them as an appetizer, a side or even use them as bread for a sandwich. 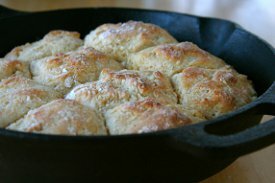 Easy Cast Iron Skillet Biscuits - These light and fluffy biscuits make the perfect breakfast recipe when topped with butter and jam. The best part is, there is no kneading, no rolling, and no cutting. 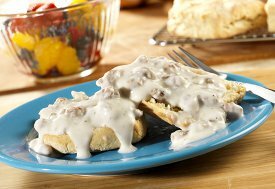 Best Biscuits and Sausage Gravy - Biscuits hot from the oven are smothered with a savory, creamy sausage gravy in this great comfort dish from Campbell's Kitchen. You won't find better easy biscuits and gravy recipes than ones like this. Easy Biscuits and Gravy - If you're running late for work and still want a breakfast staple this Easy Biscuits and Gravy is a must. There is no reason to waste away the most important meal of the day when you have the easiest of all biscuits and sausage gravy recipes handy. Mama's Cheddar Garlic Biscuits - If you're looking for down-home comfort just like mom used to make, try this deliciously flaky easy biscuit recipe. The combination of chicken broth, garlic and shredded Cheddar cheese packs a flavorful punch in Mama's Cheddar and Garlic Biscuits. Vintage Biscuits & Sausage Gravy - Bring your taste buds and warm memories along for these Vintage Biscuits & Gravy. It's the perfect breakfast to indulge on with your family. It might even remind you of simpler times. Gluten Free Cheese Garlic Biscuits - You can't get much better than melt in your mouth biscuit recipes, unless maybe if they are cheese biscuits! This new Bisquick recipe for Gluten Free Cheese Garlic Biscuits will have you saying, gluten what? It's that good. Make some up tonight. I'm serious.